Make pate a bombe with egg yolk, water and sugar. 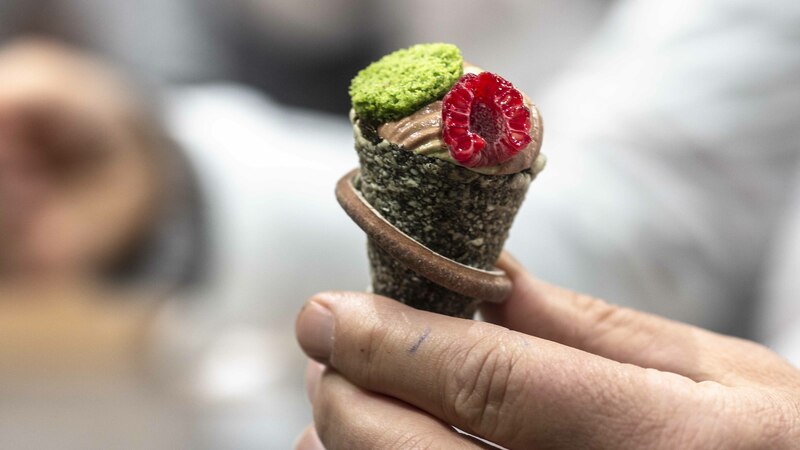 Beat cream until soft peak, add matcha powder. Apply Sticky lice onto the cut Nori. Apply Olive Oil on and bake at 190℃ for 15 min. Make Ganache with Cream, Chocolate and Vanilla. Add Lemon zest and Rice to ganache and mix. Wash rice lightly and cook. Warm half amount of Cream, mix with Chocolate and emulsify. Mix with the rest of the Cream. Beat whole egg, sugar powder and almond powder. Beat egg white and sugar. Add and mix sieved dry mixtures and melted butter. Spread on the baking sheet and bake for 8 mins at 200℃. Add water to flour, baking powder and salt, then mix. Add melted chocolate and olive oil. After kneading, rest in fridge for 1 day. Spread at thickness of 1.5mm and cut. Add brandy when it cools down. Infuse tonka beans in milk for 1 day. Take out the tonka beans and make custard with egg yolk, sugar and flour.